You may know all about playing cards, but do you know these 7 fun facts about cards? We bet you don’t, so prepare to be amused, as you won’t find these unique pieces of information in any other playing cards blog. How many playing cards are in a deck and why? Ever since cards were invented there were many variations of decks, including decks of 48, 24 and 36 cards. However, a deck of 52 cards was most popular in France and England, and as you remember, those were some of the most powerful countries in the world during colonization, so even the standard number of cards in a deck used by dominions became popular in colonies. It is curious that there are 52 weeks in a year and when you count the symbols in a standard 52-card deck, their number is 365, just like the number of days in a year. 32-card Chinese domino deck were the first playing cards invented. Back then they were printed using bone, wood, and paper, and players would sometimes use these cards not only for casino playing, but as a currency. Then playing cards spread to Egypt, India, and finally Europe. 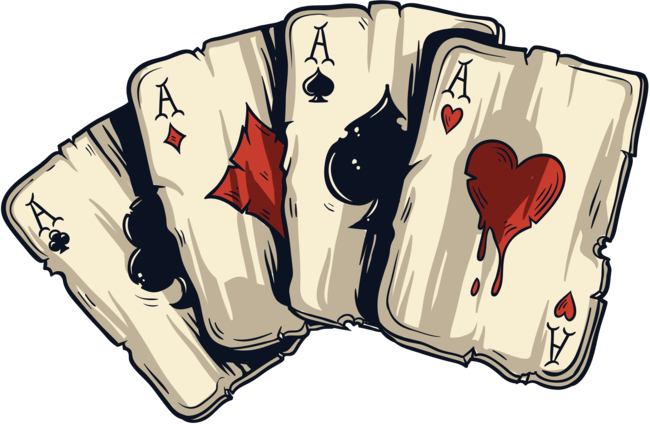 Read on to find out more playing card facts! How long are Las Vegas casino playing cards used before they are retired? Retired casino cards are often sold in Vegas casinos as souvenirs, but few people know that on a busy night these casino card decks are only used for an hour before the dealer breaks out a new deck. This is done to ensure that every card looks the same and there is no wear that may help an observant player to distinguish cards from each other. Some used Las Vegas playing cards can be up to 12 hours old if the casino wasn’t busy when they were broken out. What is the most expensive deck of cards in the world? While old decks of cards are quite valuable to collectors in the gambling world, with most expensive poker cards often selling for up to a thousand dollars on eBay and at auctions, the oldest and most expensive deck ever sold was a deck of tarot cards from 15th century Netherlands. The deck is currently on display in the Metropolitan Museum of Art in New York City, but it was previously sold to a collector in the 70s for a little under 3 thousand dollars. What are the most popular playing cards in the world? The next item on our list of facts about a deck of cards is the most famous deck, which is, in fact, not a single deck, but rather a brand of cards – Bicycle cards. There iconic decks have first gained their popularity during World War II when they were supplied to American prisoners of war. When a prisoner peeled the cards apart and arranged them in a particular way, they would create an escape map, so many soldiers owed their lives to these cards. Now these used casino cards go for hundreds of dollars at auctions, much more than Vegas casino cards. How do you shuffle gambling playing cards correctly? If you look at statistics, there are 8*1067 ways a deck of cards can be arranged, which means that there is a huge possibility that in the entire history of humanity no two decks have randomly contained cards in the same order. Therefore, it is safe to assume that any shuffling technique is efficient. However, there are two most popular techniques: at Western casinos the riffle technique is popular, and the Hindu shuffle is common at Asian casinos. When performing a Hindu shuffle, the shuffler holds the deck in one hand and picks out random sets of cards into the other hand. What does it mean – casino quality cards? Most playing cards casino uses are made from plastic, unlike regular playing cards used at home, which are usually made from paper. Vegas playing cards are made from this material to prolong the life of cards, as they wear out quickly and need to be replaced after a few rounds. Due to this, most casino used playing cards are actually still in a pretty good shape when you buy them. Another fact about playing cards at casinos is that people often try to mark them, but plastic material makes that much harder to do. Now that you’re prepared to entertain guests at your next slots or poker night with our deck of card facts, get a deck of real casino played cards, and enjoy the game!